Sure, space may be silent, or at least absent the sound waves that human ears can hear. But put that aside for a moment, and try to imagine the sound of a satellite orbiting hundreds of miles above Earth’s surface. Now imagine 19 sounds for 19 Earth-observing satellites — the murmur of ocean waves for a spacecraft that studies the oceans, or the howl of winds for one that studies hurricanes. Then swirl all of those sounds into a shell-shaped silver sculpture that looks like something from a sci-fi film. 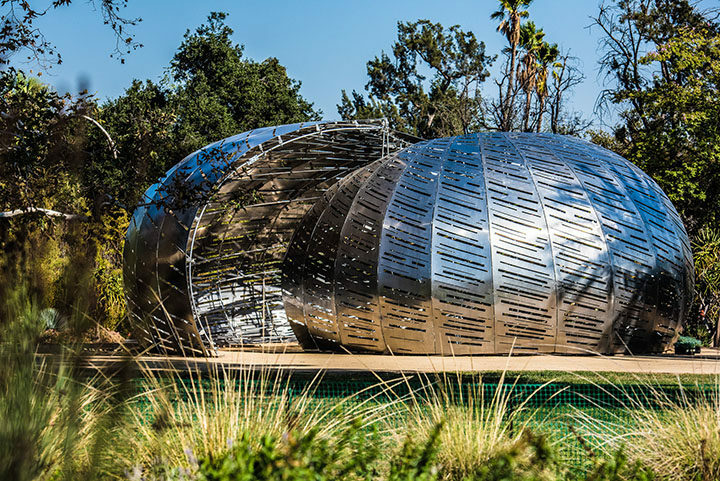 Put the shell at the Huntington Library in southern California, walk inside, and you have Orbit Pavilion — an immersive piece of art and science communication designed to envelop people in sounds that represents the orbital movements of NASA’s fleet of Earth-observing satellites. Dan Goods and David Delgado, artists working at The Studio at NASA Jet Propulsion Laboratory, initially developed the sound concept. They commissioned sound artist Shane Myrbeck to compose the soundscape, and Jason Klimoski and Lesley Chang of StudioKCA to envision and design a form. The result, as Myrebeck had hoped, is both enveloping and comforting. For a deeper dive into the diversity of the data these satellites collect, try searching a satellite’s name on Visible Earth. Or browse NASA Earth Observatory’s global maps sections and Image of the Day archive. For instance, the map below helped me understand our planet a little bit better. It depicts more than a decade of cloudiness data as observed by the MODIS sensor. Blue shows areas where clouds were infrequent; white indicates areas where they were common. Image Credit: NASA Earth Observatory, based on data from MODIS. This entry was posted on Thursday, June 28th, 2018 at 3:56 pm and is filed under In Case You Missed It, NASA News. You can follow any responses to this entry through the RSS 2.0 feed. You can skip to the end and leave a response. Pinging is currently not allowed. Congrats to the entire engineering and researchers team ! Thank you all for bringing such sounds closer to us ! !